If you think all bed and breakfasts in Vermont are like the Stratford Inn run by Bob Newhart in his show during the 80s, Vermont will surprise you. Sure, there are inns that are very similar. (Well, perhaps run a little better.) Like the Golden Stage Inn Bed & Breakfast in Proctorsville. This 8 room inn looks, on the surface, to be the usual country bed & breakfast. Small, intimate, with a comfortable mix of historic charm and modern amenities. But what is not apparent at first glance is the manner in which the owners have embraced the Vermont farm-to-table ethos with eggs from the back yard chickens, locally smoked bacon, and herbs and produce from in the kitchen garden. Many dishes are sweetened with honey from the inn’s own hives. In addition, the inn adheres to green practices such as composting food wastes, recycling, and using LED lightbulbs. What more could you ask for? Be welcomed like family, eat like kings, and find more to do in the area than you will ever have time to do. 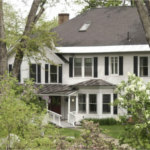 For a B&B experience that is very different, consider the Emergo Farms Bed & Breakfast in Danville in the Northeast Kingdom. This farm house with four guest rooms is beautifully maintained with magnificent views from every window. Located on a working dairy farm which has been in the family since 1858, guests can relax, explore the 200+ acres, or get up close and personal with the farm animals including over 90 dairy cows. Or just relax on the wrap around porch, stone patio or stroll to the picnic area with panoramic views on Webster Hill. Wake up to an old-fashioned farm breakfast with delicious fresh baked goods, farm-fresh eggs and more. Your hosts are happy to share the history of their farm and offer a tour. 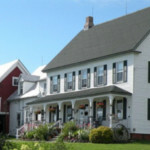 The Willow Pond Farm B&B in Shelburne is similar in some ways. This farm house is also on 200+ acres, but it is not a working farm. 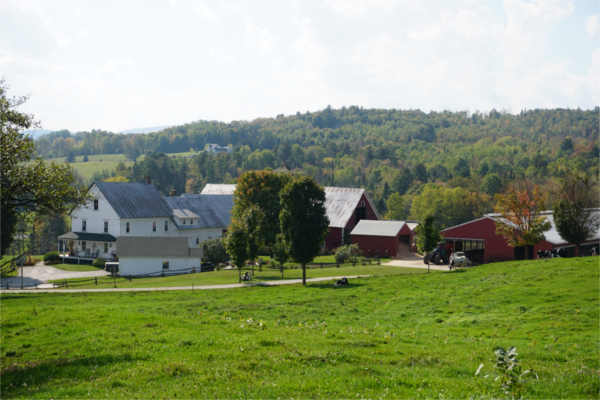 (It is next to the Bread and Butter Farm, a working farm, whose cows sometimes graze on Willow Pond’s land.) There are only 2 guest rooms, each with private bath. Breakfast is delicious and wholesome including homemade granola. Guests can take advantage of the vast acreage to relax, unwind, and get closer to nature. The gardens and ponds are home to many birds and wildlife. 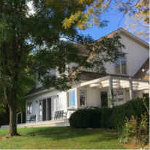 Yet, the B&B is only a 10 minute drive to Shelburne Farms and only 15 minutes drive from downtown Burlington. You get the best of both worlds – the quiet of the country with the entertainment and dining opportunities of the city. For something very special, try the in-town location of the South Shire Inn in Bennington. Located a short walk from the town’s main attractions, shops, and restaurants, the inn offers the romantic ambiance of the Victorian era. With 10-foot ceilings and raised plaster moldings, this magnificent home provides nine individually decorated guest rooms (as well as all the modern amenities including air conditioning, WiFi and private baths.) Enjoy a full breakfast of juice, fruit and choice of entrée before heading out to explore. Don’t miss the Bennington Museum with its collection of Grandma Moses paintings, the Bennington Monument commemorating a turning point in the Revolution, Bennington Potters where their unique pottery is made, and much more in southwestern Vermont. The Phineas Swann Bed and Breakfast in Montgomery Center, Vermont near Jay Peak offers some of what you expect in a B&B and something totally unexpected. First, the expected – rooms and suites with everything from gas fireplaces to TV and WiFi. There are rooms in the main house, carriage house suites, and River House suites complete with efficiency kitchens. 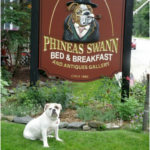 As for the unexpected – Phineas Swann is totally dog friendly! You and your furry friend are not hidden away in some dismal room, but instead have a large selection of accommodations from which to choose. Dog beds, food and water bowls, pet-sitting services, dog-walking services, special dog towels, and dog treats are all available to make your dog as comfortable as you are. There is no additional charge for one dog, although there is a $25 fee per stay for a second dog to cover cleaning costs. The Inn also offers a special Deluxe Dog Spa Package which includes accommodations in our Honeymoon suite, doggie massage, grooming, bed-sleeping permission and more. In winter you can take advantage of the Pet Perfect Ski Package which includes lodging, breakfast (with a doggie bag treat for your pet), ski passes to Jay Peak, dog-walking services and a lot of TLC for Fido while you ski. This is just a sampling of the many B&Bs in Vermont. 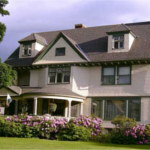 If you don’t see a location or description that suits you, check out our complete listing of Bed & Breakfasts on Vermont.com. You might also want to review Vermont inns and Vermont resorts for additional unique options. We guarantee you will find lodging that is exactly what you are looking for. This entry was posted in Activities, Now Trending, Play, Stay, Things To Do, Uncategorized on July 16, 2018 by Linda Warner. Fishing in Vermont … Why Wait for Summer? Maple Syrup Is Good For You! In like a lion or a lamb? © 1994-2016 Vermont.com / WebMont, Inc.